Imagine a totally dark space, the sound of the sea and the feeling that you are on a slavery boat in the 1800s. A heart rendering story unfurls about life as a slave on that dangerous crossing from motherland to a life of slavery. After 13 mins, some people leave the show with motion seasickness, crying, laughing or dancing! It affects us all in different ways. Braunarts Ltd, funded by a Lottery Grant, created this experience in a Frame Tent! Our challenge was to create a Frame Tent with a totally black space inside, even on the sunniest day! The structure needed to be portable and flame retardant, as this Experience was due to tour around the country – starting off at the Science Museum in London. It also needed to be robust, as people could fall in such a dis-orientating situation. Infra-red CCTV is used to watch each group of visitors to avoid any major mishaps!. We provided a Frame Tent from our Aliframe Frame Tent range, as a fully robust structure was required. The lining used was supported on an internal frame which could be linked into the the main structure without light leaking in, this was structured so technical and support areas could also be provided within the main tent. This also meant that the lining could be erected on its own inside, in places such as museums, exhibition halls and schools. The channelled nature of our frame enabled us to get the lightproofing qualities that were required so we used a serge blackout material with keder to all sides – serge was preferred to more modern materials because it performed well in sound tests. Erecting this can be a challenge. 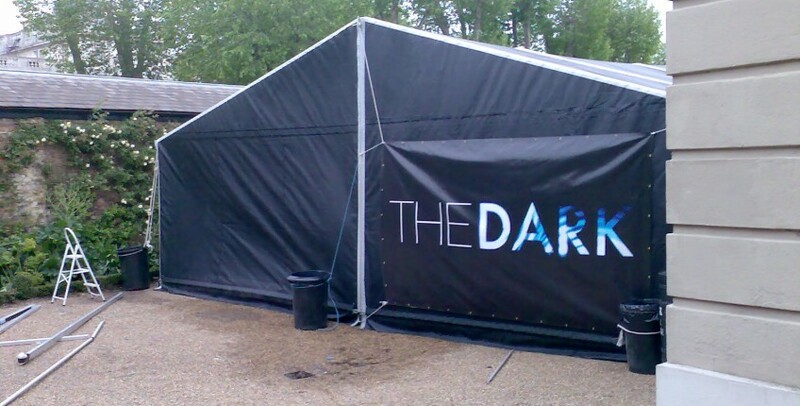 As the build progresses, it gets darker and darker! We all wear miners’ lamps during the final stages!, hence, the last thing to be installed are the side walls.